Looking for other Things to Do in Banff? 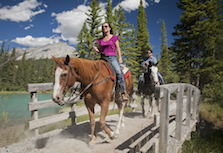 Take a look at our partner – Discover Banff Tours. Offering small group tours & activities. Sightseeing, whitewater rafting, wildlife watching, grizzly bear & wolf sanctuaries, guided hikes, rock climbing and mountaineering are just a few of the big adventures on offer. Let their guides show you something amazing!